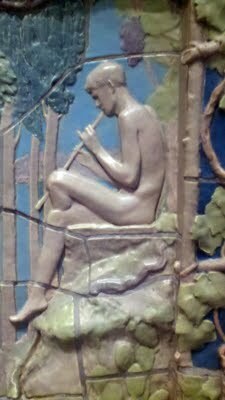 As promised, here are some of the pictures of the Rookwood architectural faience. 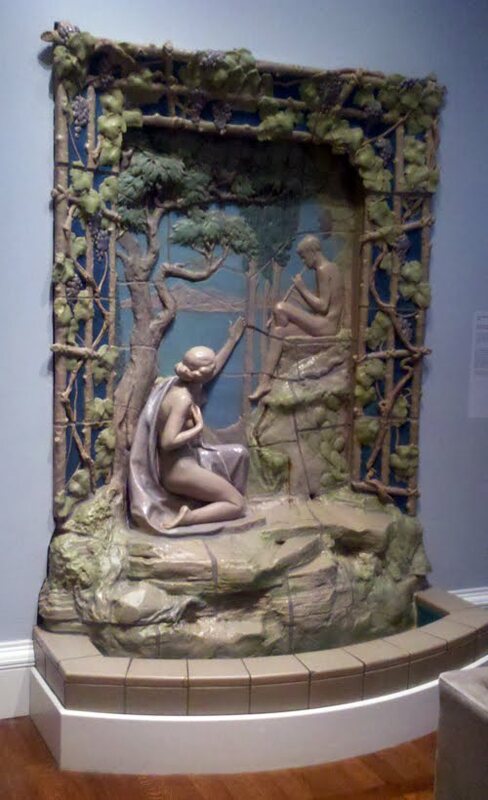 The fountain in this first picture was originally installed in the Rookwood showroom and was displayed there until the company was relocated to Mississippi in 1960. When the Cincinnati facility was dismantled the fountain was purchased by a real estate developer and installed in a bowling alley, of all places! And here I thought I was brave displaying ceramic horses in a house with young boys. At least I didn’t have to worry about someone tossing a bowling ball. The fountain is actually made of tiles, which is obvious in this photo. The woman is a separate figure set on a tile base and added to the composition. I found this concept fascinating. I have concepts drawn out for future projects that involve sculptural tiles that fit together like a puzzle, but it never occurred to me that the tiles did not have to assemble across a flat surface, or that three-dimensional sculptural elements might be added. Here is a detail shot of the bas relief pieces on the back. I wish I had taken more detail shots of all of these pieces. This mantel was a custom design done on commission. At the turn of the last century a simple stock mantel of fairly plain tiles could be ordered for $8.75 (that’s $166 in modern dollars), and an elaborate one with mantels, brackets, shelves and bas relief tiles could cost as much as $210 (equivalent to almost $4000 today). 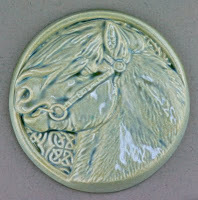 I found this interesting because my first bas relief, the Celtic Pony, was designed for the corners of my own fireplace. He never was installed because I realized I needed to do a reverse design for it to look right on the two sides. 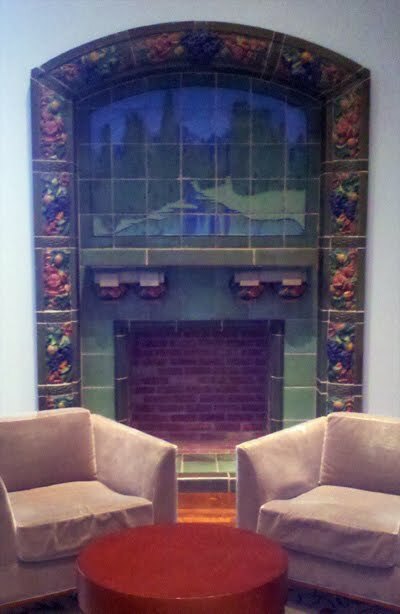 Oh, to have the time to design a whole mantel of pony tiles! 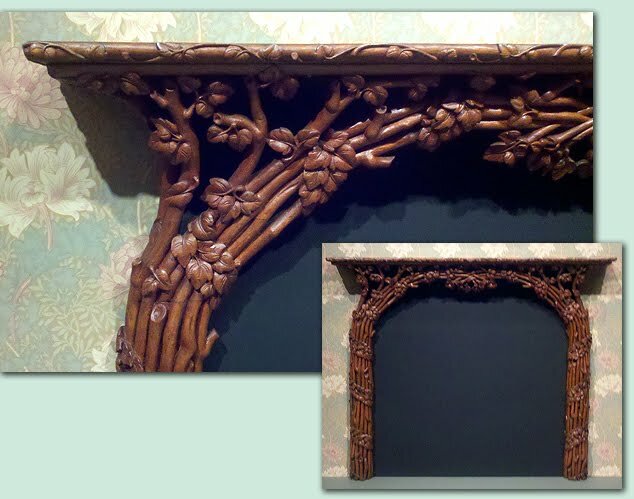 This next piece was a carved wooden mantel created for Rookwood in 1851, the childhood home of Maria Longworth Nicols Storer, founder of the Rookwood Pottery. It isn’t ceramic, of course, but I thought it was interesting to see how fine craftsmanship was a part of her upbringing. 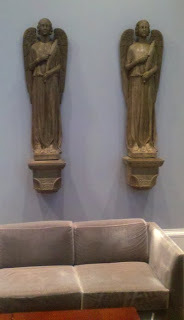 I found these two pieces interesting because they are such large ceramic castings. They are apparently the only two ever made from the mold, and were done for the Seventh Presbyterian Church in Cincinnati. They were among the things that survived unharmed the 1970 that destroyed the church, although the glaze was slightly discolored. The description card stated that the angel had been sculpted in clay and then cast with a “multi-part plaster mold”. I have to imagine the angels were themselves assembled from pieces, too. I’d hate to think how heavy those molds would have been wet, or how difficult the greenware would have been to transport. Of course, it makes it easier when your kiln is big enough to sit a dinner party. The other thing that was striking about the Rookwood Pottery pieces on display was how very different the ceramic world was at that time. The pottery rose to fame largely through wins at competitions for ceramics. The idea of high-profile competitions for ceramic products was interesting in itself, but even more so because the items were cast. That is, at least in the modern ceramic world, just not done. Cast ceramics are not considered a legitimate art form in that community. I have always thought that was a shame because relegating casting to the ceramic ghetto is a big reason why ceramic mold-making is a dying art. What I didn’t realize is that it wasn’t always that way, so perhaps there is hope that one day the skill involved will be appreciated again. 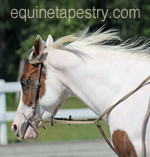 It has been quiet here on the studio blog while I get the horse color book ready for publication, but I wanted to share a recent trip to the old Rookwood Pottery while I had a moment. I’ll apologize up front for the poor quality of the pictures, but all I had was my cell phone. I was kicking myself for not packing the good camera. 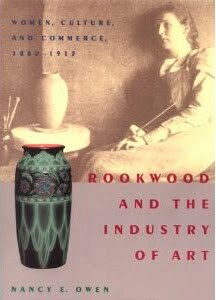 Rookwood was an influential ceramics company around the turn of the last century that played a big role in the development of art pottery. As someone who has always been attracted to the Arts & Crafts Movement – both aethestically and philosophically – I had long admired their pottery. 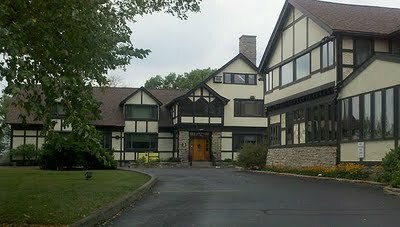 That was why my husband, back when we were newly married, suggested that we have dinner at The Rookery while visiting his home town of Cincinnati. It was the restaurant that used the old pottery building. The restaurant closed shortly after that, so I was thrilled to learn that it had recently reopened as The Rookwood Bar & Restaurant. 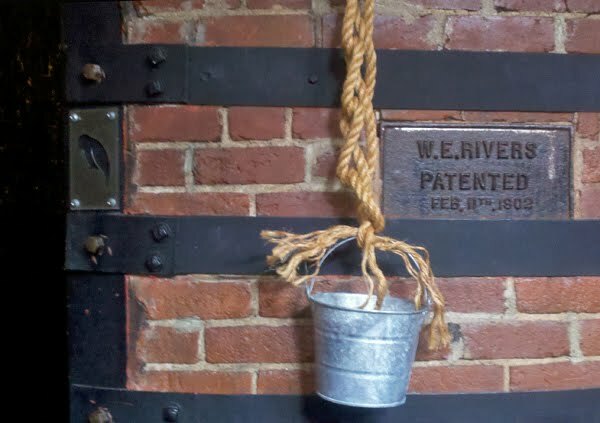 My sister-and-law and I had lunch there, and I took the picture above of one of the brick bottle kilns that are situated throughout the dining area. There are dining tables inside each of the kilns, but unfortunately my camera was not able to capture them. Here is a good image of one. These are the buildings that once housed the pottery. The buildings are located in Mount Adams which overlook the city of Cincinnati. It is a lovely setting. This is one side of the ornate gates that sit at the entrance to the old pottery buildings. 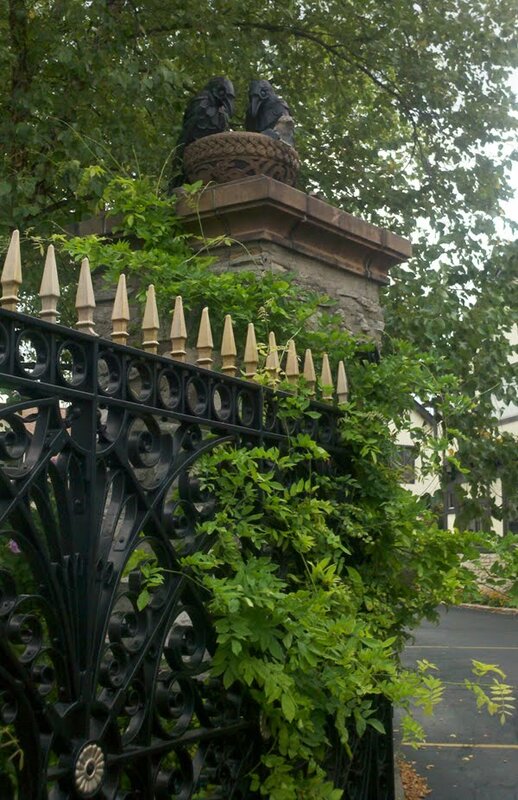 Both sides are topped with the same sculpture of nesting rooks. There is a small fountain off to the side with more rooks, too. 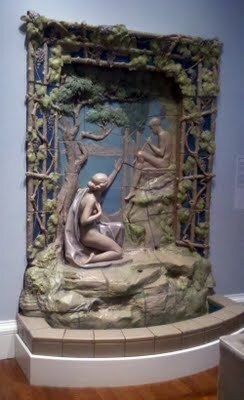 I was also able to see an exhibit at the local art museum on Rookwood faience, or glazed architectural terra cotta. (Ceramics seem to like to assign the same term for different things, just to keep things interesting. Faience is also a type of tin-glazed earthenware pottery, but Rookwood produced the former kind of faience.) I took quite a number of pictures, though not as many and not as detailed as I would have liked due to camera limitations. I plan to post those separately, since there are technical aspects I’d love to talk about here. I also picked up a fascinating book, though I suspect it might be a while before I have time to do more than peruse it. I find the Rookwood story interesting because, like most of the ceramic companies in the equine collectibles industry, it was started by a woman who initially created the items as a hobby. There are other parallels as well, like the fact that Rookwood initially offered its wares as bisque for others to glaze, and that the company made its name through success through competition. I often think the ceramic community that I am a part of is a bit odd in relationship to the rest of the ceramic world, but in some ways it seems that we aren’t odd… we are a revival!